Must be some pretty hefty amplifiers if this would happen to you, I have installed several aftermarket amps in both 204 and the 212 model, have always utilized the rear SAM module power feed and have not yet experienced any voltage cutoff problems. How big is the wire going to the fuse box? I can't imagine it's big enough to power the amp, especially the one that you said you were going to get from ebay. What size amp? Usually those amps require at least a 4-8 gauge wire. The wire that runs to the fuse box is 0 gauge. I spliced into it with an 8 gauge power line. And as for the sub and amp I got the MTX Terminator sub and amp. Really good for bass. 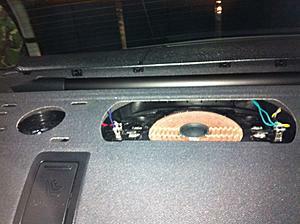 And I also hooked it up so my stock sub gets more bass just like the MTX. Ants, what color was the deck sub wire set that your hooked into? I see more then one speaker up on the deck of my HK system.. I assume a couple are surround speakers and the center is the factory "sub" ? Is there an amp on the Audio 20 system or no? I'm trying to keep all my wiring in the trunk if I can help it. But if not, I'll pull out the head unit. I found the factory sub under the rear deck and took left & right line level output right from the leads. My infinity sub is working well with only wire being gain control up front. For power i went direct to battery, ground was beside factory fuse assembly truck passenger side. I'm trying to run my re-Q to the best possible source. I may just take the headunit out fwiw. I want to do it right the first time around. Shouldn't be too hard to run RCA's to the rear, I'm hoping. is that bazooka sub woofer a good one?? Great write up thank you very much.. Did about the same thing for mine the only difference is I used a line level converter and disable the stock sub in the rear deck. The rear sub is a dual voice coil sub so I used each coil for a line. Power from battery or from sam module? Is there any connections from the Command to use? Or do I have to use power from the lighter? Just installed two 10" subs and amp. Pulled power from Sam module with installation of power distribution block. Works perfect. High level inputs to RCA converter taken from rear speaker. Remote wire taken from cigarette lighter in glove box. One week no issues, except my car massages me now. I have installed my Focal Sub, and I used a hi to low converter with remote control signal. Since I have a diesel car, I have the battery in the trunk, and just pulled power from the battery. It works very well I think, with an increased sound performance. Do you have any pics of how you tapped the power wire to the fuse box ? Im planning to do the same thing like u did to my CLK but im just not sure that i have the rear SAM module like your have. Also, where did you connect your control wire ? I am about t install a sub amp and sub box tomorrow and I was wondering if you or anyone else out there who's gone before me remembers if it was difficult to remove the factory HK sub from the rear deck and if the + & - cables are clearly marked? From the pic TRDRunner posted the left side has two different colors and the right side looks to have the same color for both. Nate, what sub and amp are you installing? I'm getting ready to do the same thing you are and have the same question about the +/- on the HK sub. Do you plan to just disable the HK sub? I'm going to use Audiocontrols new LC2i instead of a standard LOC, I've heard great things about it. "I didn't cut plates in the rear deck, but moreover make "ski" holes in the plate of steel behind the rear seats. several circular holes with a hole saw and a large squared off hole where the armrest flips down for skis. The black plastic shroud behind the fold-down armrest pops right off so you can get access to it. As far as obtaining a signal for amplifiers goes, I used an OEM integration unit. Of course it keeps absolutely every steering control, phone, etc useful. Which I HIGHLY recommend using way over a LOC." Is there any problem when you disconnect the battery from system? When you reconnect the battery everything are normal? Any error appear? You will not have an issue as long as you don't underpower the subs.I installed the Infinity Basslink (10"w/200 watt amp) and the bass passes into the passenger compartment with ease. My previous car had 2 12" JL's and then 2 12" MB Quart Premium subs so I was accustomed to heavy bass output. If I am happy with the 1 10", you should be more than pleased.